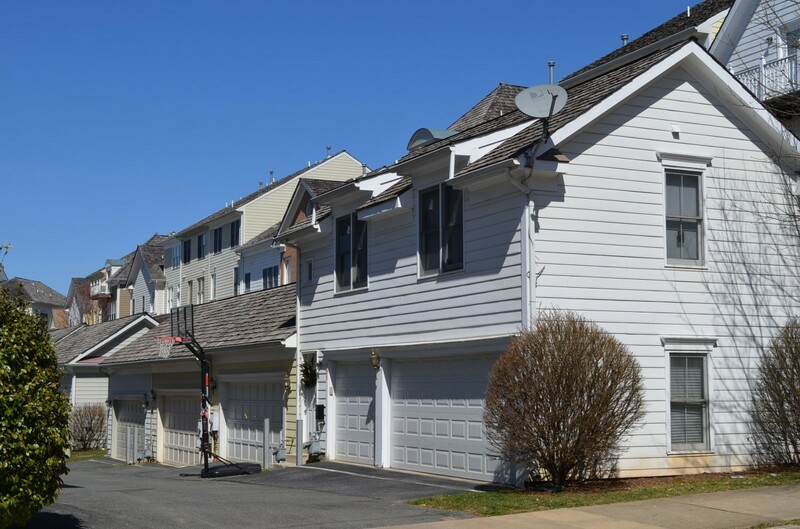 A garage with an apartment over it in the Kentlands neighborhood of Gaithersburg, Montgomery County, MD. Image by Montgomery County Planning Department. Our region is facing a deep housing shortage, especially of affordable housing, and we need to add about 25,600 new units per year to meet projected population growth. One way homeowners can contribute to the housing supply and make some cash is to build an accessory apartment, also known as an accessory dwelling unit or ADU, on their property. Common examples of this type of housing include English basements, studio garages, mother-in-law units, and carriage houses. Even though accessory apartments have become legal in parts of DC, Maryland, and Virginia over the past few decades, we have yet to see a renaissance of this housing type in our region. Why not? The answer varies between jurisdictions, but in Montgomery County, Councilmember Hans Riemer is tinkering with the policy levers to see if he can improve output. Accessory apartments are evergreen topics at urbanist parties for two reasons. First, there is a large legacy inventory of this housing type in our region, where thousands of accessory apartments were created without special permission before modern zoning and building codes dried up production. Many residents can fondly recall (or are currently living!) in a basement apartment below a single-family house occupied by a family. We have personal familiarity with this housing type through our own lives and/or social networks. Even those who lack personal experience might remember that the Fonz lived in an accessory apartment on Happy Days, or as GGWash contributor Payton Chung pointed out in a recent appearance on the Kojo Nnamdi Show, that Big Bird lives in an accessory apartment attached to the multifamily brownstone at 123 Sesame Street. Second, bookish urbanists, including Riemer, devoured last year's Backdoor Revolution by Portland accessory apartment entrepreneur Kol Peterson, and have taken note of UC Berkeley professor Karen Chapple's extensive practical and scholarly investigations of the potential market and impact of accessory apartments. Simply put, accessory apartment as a housing form and a matter of policy have broad appeal. Accessory apartments are traditional, empower homeowners, appeal to diverse potential tenents from grandmas to post-millenials, and require only incremental change to existing urban form and "neighborhood character." In a regional market where housing in highly accessible locations can be extraordinarily expensive, accessory apartments are a meaningful option to increase supply. The form also speaks to dramatically changing demographics, as baby boomers seek to age in their existing homes and younger households are forming later and averaging smaller. For all these reasons, there are an unknown and potentially very large number of legacy and informal accessory apartments already established. Urbanists and housing advocates would love to see more. City of Alexandria Not permitted. District of Columbia Broadly permitted since the 2016 zoning rewrite. Fairfax County By special exception from the BZA. And yes, people can and do go through that process and actually build accessory apartments in Fairfax. Prince George's County Permitted only in the Gateway Arts District, a zoning overlay soon to be eliminated by a county-wide map amendment to implement the 2018 comprehensive zoning rewrite. New legislation recommended by the recent Comprehensive Housing Strategy. Montgomery County Permitted, with strict parking and setback requirements. Here's an excellent summary of current policy by Jane Lyons. Arlington County Permitted since 2009, streamlined in 2017. Current regulations on detached accessory apartments are a target for reform. Please note that this summary does not include most of the independent cities of Virginia, or Maryland municipalities with local zoning control such as Rockville and Laurel. Many of these smaller jurisdictions have more longstanding and progressive accessory apartment legislation on their books than their surrounding counties, though for some the inverse is true. Research from other jurisdictions has demonstrated that policy makes a tremendous difference in accessory apartment production. Screenshot from page 9 of "Jumpstarting the market for accessory dwelling units: Lessons learned from Portland, Seattle, and Vancouver," by Karen Chapple, Jake Wegmann, Farzad Mashhood, and Rebecca Coleman. Chapple et. al. found that Portland's accessory apartment bloom did not sprout until design standards were revised multiple times, and parking, setback, and fee requirements were greatly reduced. These reforms were necessary to reduce the cost and complexity of adding these small housing units, and matched the burden of the regulation with the magnitude of the change being proposed. There are only 133 licensed accessory apartments in Montgomery County. While between 40 and 60 are being added per year, that's not really going to have an impact on the housing options available at the market level. The restrictiveness of the current regulations also does not encourage homeowners to legalize their existing informal accessory apartments. Remove the prohibition on detached accessory apartments in small lot single family zones (R-200, R-90, and R-60). This enables garage conversions for the Fonz or tiny houses like Dr. Chapple's in Berkeley, CA. All new construction would still have to meet the building code, lot coverage, setback, and other requirements that would apply to any other construction in a residential zone. Remove the prohibition on detached accessory apartments on lots smaller than one acre. Remove the prohibition on accessory apartments in basements. Remove the maximum size limit on accessory apartments and additions to accessory apartments. Remove the prohibition on accessory apartments in houses that are less than five years old. Remove the requirement that an accessory apartment be a minimum distance from other accessory apartments. Require two off-street parking spaces on the property (or homeowner can seek a waiver as under current law). The current code requires three off-street parking spaces if the property already has a driveway with at least two spaces, and two off-street spaces if there was no pre-existing driveway. The code would still require that the primary property be owner-occupied, that no more than two unrelated individuals can reside in an accessory apartment, that there can only be one accessory apartment per property, and that accessory apartments cannot be used as short-term rentals (i.e. AirBnb). Even though these proposed changes are incremental modifications to an already incremental land use change, there is relatively high-profile online opposition and fear-mongering regarding the proposal. Some assert that it will harm affordability by increasing the value of the land existing single family homes rest on, thereby driving up assessments and taxes. However, the reality is that the value of land in our region continues to rise for a variety of reasons. If we do not provide alternatives to monetize this value, such as accessory apartments, what happens instead is that modest homes are torn down and replaced with McMansions. There is no such thing as a stable neighborhood that never changes, only alternative answers to the question of who gets to live where. There will be a public hearing on Riemer's proposed zoning text amendment (ZTA 19-01) on Tuesday, February 26 at 7:30 pm in the Third Floor Hearing Room of the Council Office Building at 100 Maryland Avenue in Rockville, Maryland. While the hearing list to testify is already full, you can provide written testimony or comments at any time to County.Council@montgomerycountymd.gov. What Metrorail station is between Friendship Heights and Medical Center on the Red Line? Feel free to ignore station subtitles.